Tusok Balita - NDFP Goes Overseas for NDFP-UFDC Classified Doubles in Abu Dhabi, U.A.E. NDFP Goes Overseas for NDFP-UFDC Classified Doubles in Abu Dhabi, U.A.E. 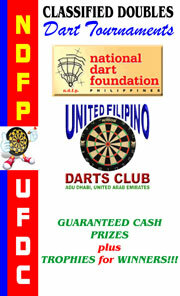 United Filipino Dart Club (UFDC) and the National Dart Foundation of the Philippines (NDFP) present the first joint partnership Classified Doubles Tournament on May 19, 2006 at the UFDC Darts Center, Al Jazeera Bowling and Billiards Hall, Abu Dhabi, United Arab Emirates. This is a project of UFDC President and NDFP Middle East Coordinator, Ronel Botor, to promote darts among the Overseas Filipino Workers and their families in the United Arab Emirates. Botor boasts that darts is alive and kicking not only in Abu Dhabi but also in Dhubai. This is the first of a series of cooperative ventures between the NDFP and UFDC, and hopefully the full integration of the Filipino OFW’ darters in the regional support network of the Middle East. To Ronnel Botor and the rest of the UFDC, more power to you, as we simultaneously strive to uplift Philippine darts and uplift the Filipino darters where ever you are.